It is an honor and privilege for me to welcome you, on behalf of Iraqi Christians. I see Baghdad, the capital city of our beloved country, delight and bright for embracing you, who seek peace and love. Such an overwhelming joy that reminds me of prophet Isaiah’s words: “How beautiful .. are the feet of the messenger announcing peace, of the messenger of good news, who proclaims salvation..” (52/7). Thank you so much for coming. 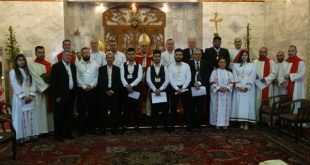 The convening of the 26th Conference of the Catholic Patriarchs of the East, for the first time in Iraq, has a significant impact on our presence as Christians, in such difficult circumstances, facing the unprecedented challenges of its’ kind. Your presence here today, as Leaders and Fathers of ancient Churches is truly a strong expression of your solidarity and being with us in all that we have been through from, persecution, displacement, abandonment, forced emigration…etc. This assembly in Iraq, at this particular time, fills us with hope and encourages families to return and stay in our homeland keeping up our faith, identity, ethics, traditions and language. 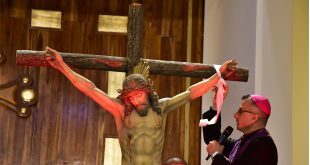 At the opening of the Synod of Bishops that was held in Rome (October 3-28, 2018) “Young People, the Faith and Vocational Discernment”, His Holiness Pope Francis addressed the importance of “may the Synod awaken our hearts!” To be “extremely fruitful for giving rise to hope.” Based on that, let me wish that our gathering is a turning point of “grace and blessing” for Christians and our fellow citizens in this “troubled” East, with a hope for a better future of peace, stability, and prosperous society. Today, we are called to create a unified Eastern Christian vision that plans strategically, to sustain our existence and our role in this part of the world by: being stronger than the “division”; removing the psychological and historical barriers; and also, by respecting the differences in ideas and opinions, which is very natural. Realizing this unity of our Churches is “required” and crucial, as a response for the call of Jesus Christ (John 17/27) and to help us attaining an influential presence in the future, in spite of the “pressing” challenges we are facing, such as emigration and the “religious extremism” which is the most serious problem. The Old Testament displays an exquisite experience about the theology-Spirituality of “displacement – captivity”, return and construction. These texts contain a rich, “fertile” and inspirational heritage, that is required in these circumstances, for the support and development of the spirituality of our displaced families in Iraq and Syria, to help them return and construct their homes. Therefore, this cooperation of all Churches in the region is urged to focus on “highlighting” the theology – Spirituality of the displaced and the emigrants; the theology of return and the celebration of construction and renewal. Moreover, we together, have to hold on it, since it represents the “spot light” of Christian hope that should grow and spread. This conference is a “vital” message to all Iraqis, and Midlle East citenzens towards eliminating intolerance, endorsing dialogue, spreading the values ​​of peace and citizenship, consolidating the principles of coexistence through recognition, acceptance and respect of privacy, which is almost “missing” in our societies. In the spirit of such a blessed environment, of true renewal for a better tomorrow, we have a hope that the new recently formed Iraqi Government give the priority to a “serious practical” plan for community reconciliation; a strategy based on citizenship, law, equality and provision of services for all Iraqis, to live in freedom, dignity and social justice.